I think breakfast is one of those things that you either love it or hate it. Personally, I love it. But sometimes it is hard to find variety with the meal…especially when traditional Western “breakfast foods” are full of starches. No toast, pancakes, cereals, or oatmeal for this girl. So what’s left??? I’ll tell you what’s left…an abundance of ingredients just waiting to start your day off right! I tried my hand at a broccoli frittata for the first time this weekend. I’m so glad I did because it was delicious! Plus, it’s fun to say frittata…frittata, frittata, frittata! Sorry, I’m done now. Now, a traditional frittata is made in a skillet on the stove. But I was batch cooking and all of my stove burners were occupied, so I baked it instead. Maybe it is more of a casserole than a frittata now?? Oh well…. This morning I topped it with some fresh salsa. How would you top yours?? Crack eggs into a bowl along with the cottage cheese and whisk together. Then add the broccoli and onion to dish. 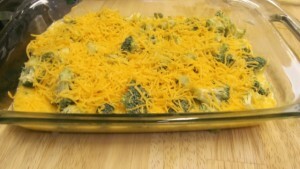 Top with shredded cheddar cheese. Bake until center is set (about 15-20 minutes). Cottage cheese? How much and what kind? Hi Diane! Cottage cheese would be a great topping for this Broccoli Frittata. How much is up to you, we just recommend choosing low fat or non-fat varieties. Lauren said mix the eggs with the cottage cheese but did not list cottage cheese as an ingredient. How much do we mix with the eggs? Oh, I’m sorry, I didn’t catch that. I’ve corrected the recipe. It is 1/2 cup lowfat cottage cheese. Thank you for catching that mistake!